Completing my not-so-traditional Deviled Eggs Platter promise! Quick and Easy Jalapeno Poppers Deviled Eggs with all-you-want-in-jalapeno-poppers topped on doubled eggs.. even crunchy breading! These spicy deviled eggs are bursting with flavor and heat of two kind of jalapenos, pickled and roasted, and have filling of cream cheese and feta to balance the heat! These look scrumptious and taste amazing, both at once! If you like to explore deviled eggs territory, flavor of these will surprise you! 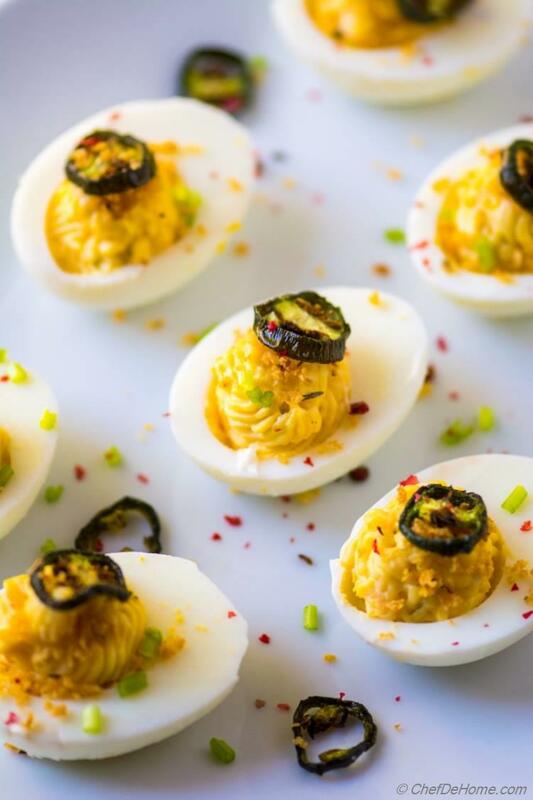 These deviled eggs are an experience of it's kind and will be favorite of any Jalapeno Popper Lover! These are not your traditional deviled eggs because there is no mustard or dill pickle in this recipe. Honestly, deviled eggs, or I should say, boiled eggs are blank canvas, we can paint it many ways! Like add some healthy green color as in these Avocado Deviled Eggs or add some hot tangy flavor as in these Buffalo Chicken Deviled Eggs! So, stay with me, let's step-out of traditional-mayo-mustard-deviled-eggs.. and let's serve something different for Easter Brunch! Little spicy, crunchy, and more flavorful! 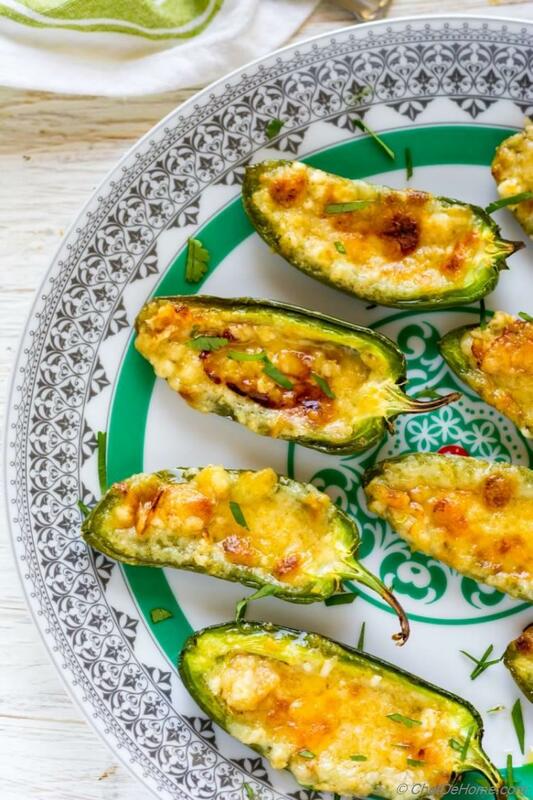 Today, I used two kinds of jalapeno to give a stylish-kick to this finger food. Minced picked jalapeno in the filling, and roasted jalapeno on top.. I stuffed these deviled eggs with cream cheese, egg yolks, feta cheese, lemon and of course jalaepnos! 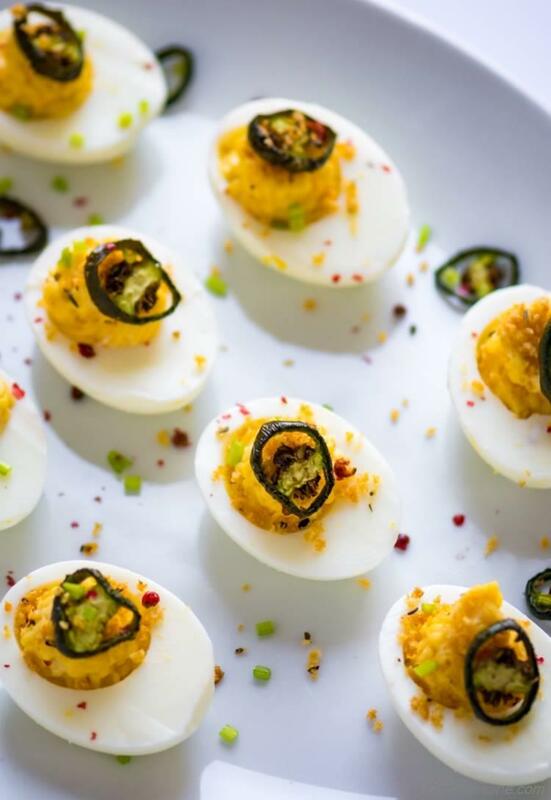 What makes these jalapeno poppers deviled eggs spicy is - roasted chili pepper on top. You might think, I told you in my Baked Jalapeno Poppers post that roasted jalapenos are not hot. Well, it is still true. These sliced ones are hot because seeds and stems are still intact. 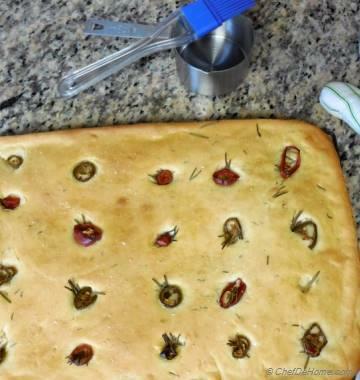 Where, if you remember, in baked jalapeno poppers recipe, we removed both - stem and seeds. If you are vary of jalapeno heat, remove seeds before roasting. This recipe does need 20 minutes to ready the toppings. But, you can ready the toppings while eggs boil which always works out great for me. 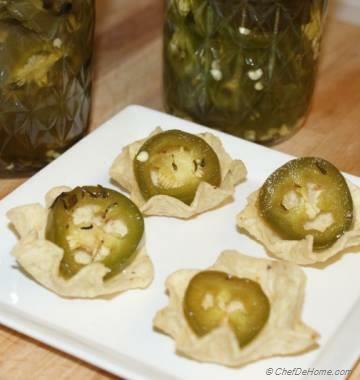 Or if are time pressed, you can use pickled sliced jalapeno instead of roasting them. And seasoned pre-toasted breadcrumbs instead of toasting fresh. However, both of these step does not need your active 20 minutes. 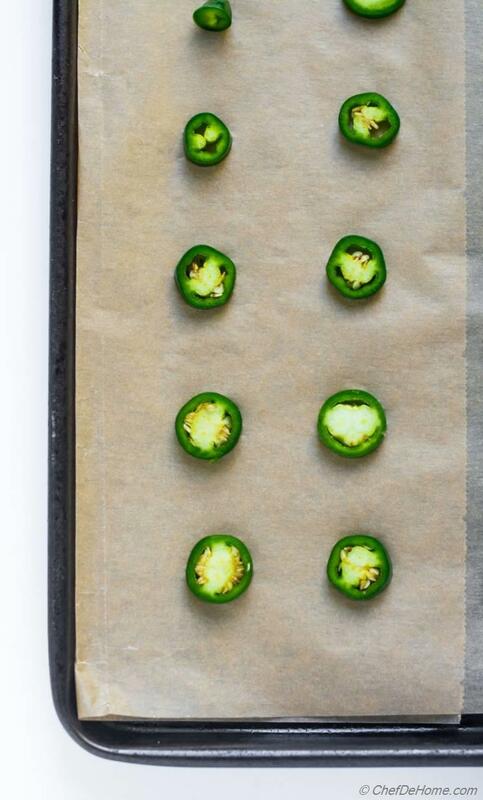 All you have to do is: preheat the oven, and place tray with jalapeno and breadcrumbs in the oven. Then just wait and let oven do it's magic. To make Jalapeno Deviled Eggs, I first set the oven to preheat while I gather all the ingredients. Then, I place the jalapenos in oven to roast while ready eggs to boil. By the time eggs get ready, jalapeno are ready too. I, then, spread breadcrumbs with seasonings on same baking sheet and leave to toast while I peel the eggs. Once eggs are peeled and sliced, I mix-up yolks, mayo, cheeses and seasonings in a bowl or food processor. That's it. All ingredients are ready to assemble Jalapeno Popper Deviled Eggs! I don't own a deviled-egg platter (yet). So, my favorite is any white platter. Have you ever had trouble making deviled eggs stand straight upright on flat platter? If so, do this! Just use a sharp pairing knife and slice opposite edges of peeled egg by 1/10 of an inch. Then, slice in half from middle so that small cut portion ends up as bottom. This will make bottom of each egg-half sit flat and eggs will stand upright on any surface! Boiling Eggs: For making a perfect deviled eggs, it important to learn to boil perfect hard boiled eggs. I opt these two ways to boil eggs: lazy way or faster way! 1) I like to use freshest possible eggs because these are very easy to peel. 2) To boil, I fill sauce pan (large enough to hold 12 eggs) with room temperature water. 3a) Lazy Way: Bring to boil with eggs. Then, switch off heat and leave aside for 10-12 minutes or until cool to handle. Then, peel. 3b) Fast Way: When in hurry, I take a short cut. I bring water to boil with eggs and keep boiling at high heat for 5 minutes. Then, remove from heat and run through tap water to cool down, and peel. 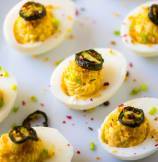 Do you like traditional deviled eggs or like to explore the topping options? Leave a comment below and share with me! Few more delicious Easter Brunch Ideas! 1. Pre heat oven at 400 degrees Fahrenheit. Boil eggs with room temperature water until start boiling. Once started boiling, remove from heat and set aside in hot water for 12 minutes. 2. Line baking sheet with parchment paper. Slice 2 jalapeno into thin rounds. Spray oil, and sprinkle salt. Roast for 10 minutes. If don't want to roast, you can also use pickled jalapenos. 3. 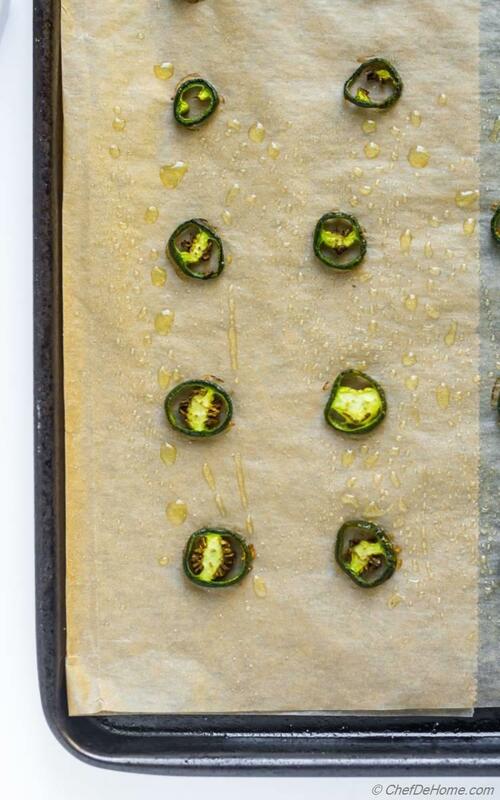 Remove jalapeno from oven, lower the heat to 350 degrees. Mix breadcrumbs with a teaspoon of oil, and generous pinch of salt. Spread on baking sheet and bake for 10 minutes or until golden and crispy. 4. Once eggs have cooled. Wipe these dry. Peel the eggs and slice in half. Remove egg yolks in a bowl, carefully set aside egg halves. 5. In food processor, combine eggs yolks with rest of the ingredients and process to make smooth filling. Taste and adjust salt. Spoon or pipe over egg halves, Place filled eggs on deviled egg platter. 6. 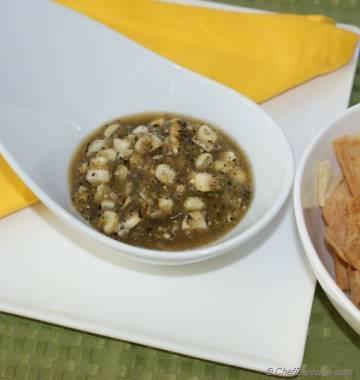 Top each with slice of roasted jalapeno, and sprinkle of toasted bread crumbs. Garnish with herb of your choice. Serve and enjoy! Are you using yellow mustard or Dijon? I used yellow mustard for this recipe. Dijon works fine too. I would adjust both to taste.